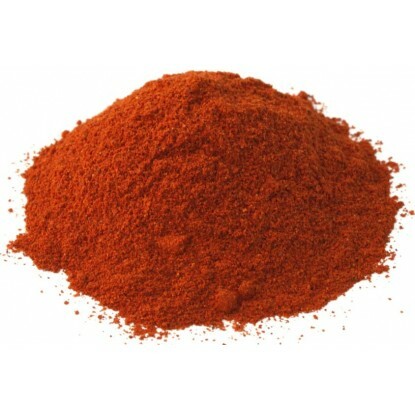 Achiote, Spanish for annatto, is common in Caribbean and South American cooking. It has been called "poor man's saffron" for the color is similar to the more prized seasoning. At first glance, annatto seeds resemble fishbowl gravel. The color of terra cotta and the shape of small stones, this spice looks rather inedible. Annatto seeds are often ground for cooking or processed to use as a "culinary dye." The thin coating of the seed is removed to produce a basic pigment known as "bixin." This is what gives color to butter and cheese as well as salad dressings, fish products and confections. Annatto is a shrub native to the Caribbean, South and Central Americas. Also referred to as the Lipstick tree, it has glossy leaves and pink starburst flowers. Seed pods are picked just as they begin to split and then dried in the sun. Peru is the largest producer while Brazil and Kenya are both known as major annatto processors. Achiote, Spanish for annatto, is common in Caribbean and South American cooking. It has been called "poor man's saffron" for the color is similar to the more prized seasoning. The ground seeds are often found in sauces, stews and rice dishes. The flavor is "earthy," somewhat dusky but rich. The seeds give off a lemony odor but none of that comes across in the taste. Ground seeds are available, too. Use the powder for enhancing sauces, chicken dishes and Mexican recipes. 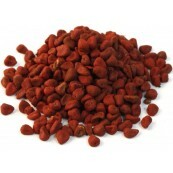 Annatto contains amino acids, calcium, iron and phosphorus, as well as vitamins B-2 and B-3. Annatto also contains beta-carotene and vitamin C, which are both potent antioxidants that help to prevent free-radical induced damage to your cells and DNA. It also contains the phytochemicals cyanidin, ellagic acid, salicylic acid, saponins and tannins. Phytochemicals are compounds found naturally in plants that help to prevent and treat disease in humans. Annatto seeds have diuretic, antibacterial and astringent properties. They are also used to help tone, balance and strengthen the liver and reduce liver inflammation. They are also purported to lower total cholesterol levels, reduce blood pressure and treat edema. Stored in an airtight glass jar out of the sunlight in a cool, dry place.